To this day, elder abuse continues to be one of the greatest medical catastrophes throughout the United States. According to the National Council on Aging (NCOA), as many as one in every 10 people in the U.S. over the age of 65 face some type of elder abuse, while roughly five million elderly Americans are abused each year. Elder abuse is defined as any form of physical, sexual, or emotional harm conducted against an elderly person. The most common perpetrators of elder abuse include assisted-living facility workers, medical personnel, and family members. Despite the extensive research conducted on the impacts of elder abuse, we still have a limited understanding of the long-term impacts of emotional abuse against an elderly person. Emotional abuse is defined as abuse coming in the form of verbal attacks, harassment, or threats of future physical attacks. While emotional abuse does not come with the easily noticeable symptoms of physical abuse, such as skin lacerations or bruising, substantial changes in behavior can be a sign that this type of abuse has occurred. If you believe that an elderly family member is facing abuse, it may be time to seek out legal representation. Thousands of elderly Americans rely on the compassion and patience of their caretakers, leaving them susceptible to many forms of abuse. Emotional abuse can cause immense pain and suffering for elderly patients while having a long-term impact on their demeanor, confidence, and outlook on life. Changes in relationship dynamics among loved ones or staff members. In severe cases, emotional abuse can lead to a steep decline in the physical well-being of the victim, as some victims lose interest in eating and even resort to self-harm. Undoubtedly, the impacts of elder abuse cannot be understated, as research conducted by the NCOA found that elderly Americans facing some form of abuse have a 300% higher risk of death than those that do not face abuse. At Flaherty Law, we understand the impact that elder abuse can have on the whole family. Fortunately, our staff has years of experience working to help elderly Americans who have been wrongfully abused by those they rely on the most. 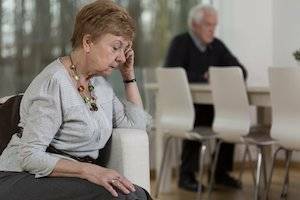 If you believe that an elderly loved one has been the victim of emotional or physical abuse by a caregiver, you should contact our experienced Will County elder abuse attorney. To schedule a consultation, free of charge, contact us at 815-577-7500.